DirectDraw emulation is broken in Windows 8/10 causing performance issues. See "Low frame-rate and graphical glitches"
SafeDisc v1 and v2 DRM[Note 1]. Disc check requires latest expansion installed. The Sims: Complete Collection includes the base game and all 7 expansions. 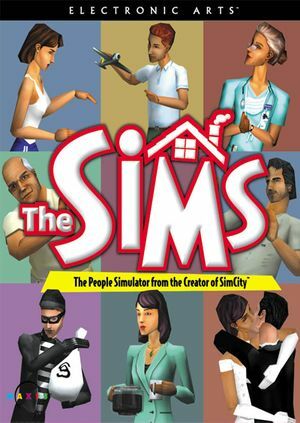 An earlier release of The Sims on Linux was included in the MandrakeLinux Gaming Edition package, released in 2001 exclusively for that distribution. This page covers the 2003 TransGaming release, released for all Linux distributions. This is also the preferred installation order, installing expansions in other order may introduce problems or simply can't be installed. If installed in wrong order it's recommended to backup save data, completely uninstall the game and install again in correct order. Released as "Livin' It Up" in Europe. Requires Livin' Large to install. although installer still refers to it as Vacation. By default the game does not allow for zooming in and out using the mousewheel. Use the following to add in mousewheel support. 1. Download and install AutoHotkey. 2. Rightclick an empty space in any folder and go to New > AutoHotkey script. 3. Rightclick it and choose Edit. 5. Save and run the file then start the game. When you are done, push F10 to exit the script and restore default mousewheel functionality to windows. Stabilizes gameplay, increases frame rate to 60 FPS, and fixes severe graphical glitches when using Alt+Tab ↹. DirectDraw emulation is broken in Windows 8/10. Extract the contents from the .zip file into the game's installation folder. Game saves are in form of neighborhoods instead of a single household. Save folders are numbered (the first neighborhood is numberless). Initial setting up of new neighborhood and household may take several minutes even with higher end machines, and it takes longer as more expansion packs are installed. Natively available resolutions are 800x600 and 1024x768. Change through the game's launcher. See Widescreen resolution. Use the -w command line argument. Frame rate is capped under 30 FPS. A pre-patched executable is available for 1920x1080; for other resolutions see the WSGF entry. Unable to zoom in as close as the default resolution. Some HUD elements become difficult to read due to rendering errors, such as the employment screen. Can see more at once. Copy this EXE file to your Sims installation folder. Run the file or rename it to Sims.exe to overwrite your original. Alternatively, follow the WSGF guide to patch in any resolution of your choice. Game played in 1024x768. Game is designed for 800x600 resolution, so sometimes borders are added to fill the space. Game played in 1920x1080 resolution after patching. 5.1 only. No positional audio. The rear speakers are used for reproduce only background effects (like neighborhood noises). Speech is subtitled with generic icons, important speech e.g. phone calls are given as popup window. Pauses the game on Alt+Tab ↹, option to disable. Game has to be installed with desired language option. Starting from Vacation expansion pack. Installing that or later expansions changes language. At the time The Sims was released, it had the potential for crashes and issues. With each expansion, the game became less stable, and even on properly configured systems would crash periodically. This has not improved over time. Problems may vary from not being able to install the game, from not being able to launch the game, instability along with performance issues and lastly not being able to save the game. This is especially prevalent on Windows 10, when disc-based DRM was completely dropped along with broken DirectDraw emulation. See "Low frame-rate and graphical glitches". Go to main discs root and open folder Setup. With most cases simply open Setup.exe, however to make sure correct language is used open Setup_Language.BAT and replace Language with desired language option. Content of the Setup folder varies from game and expansion. When asked installation location select different location. For some users simply removing (x86) from path, but it may be safer to install either root or another drive. After installation navigate to <path-to-game>. Open properties of Sims.exe and open compatibility tab. Select Windows XP (Service Pack 2) compatibility mode and check Run as an administration. Select OK and open the game via shortcut. If using Windows 7, 8 or 8.1, uninstall Windows Update KB3086255 before the game installation. Select the update with the code KB3086255, and uninstall it. It is possible for the game files to become corrupt, requiring a complete reinstallation. The Sims CD contains a tool called SimsEraser that will clean all traces of the game left over after an uninstall. Uninstalling the game, running SimsEraser, and reinstalling will restore the game to its original state. The Sims attracted a large modding community, allowing further customization features. Unfortunately, even properly designed mods could increase the chances of crashes and errors in the game. Mods have a major impact on loading time and stability, and should be used with discretion if you are having issues with the game. These mods were created by Maxis and formerly hosted on the games official website. This page was last edited on 4 March 2019, at 07:33.